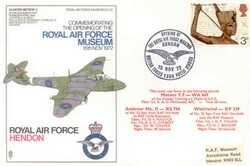 Cover for the 50th Anniversary of the Avro Vulcan depicting the first prototype Vulcan VX770 on its first flight and also Vulcan XM607 taking off from Ascension Island during the Black Buck Raids during the Falklands War in 1982. 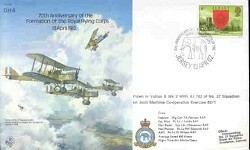 The cover bears a 50p Avro Vulcan stamp issued by the Ascension Island post office to mark the 20th Anniversary of the Liberation of the Falklands and is cancelled with the first day of issue postmark 14 June 2002 showing a Harrier Jump-Jet. 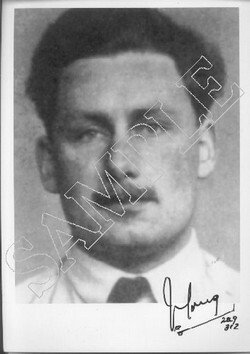 Signed by all three Black Buck pilots - Squadron Leader Neil McDougall DFC, who flew Black Buck 4,5 & 6 and was awarded the Distinguished Flying Cross for his attacks, the second signature is that of Squadron Leader John Reeve, who flew Black Buck 2 and the third signature is that of Flight Lieutenant Martin Withers DFC who flew Black Buck 1 and 7, the first and last of the bombing strikes and was also awarded the Distinguished Flying Cross for his involvement. This is a rare opportunity to purchase a Vulcan cover signed by possibly three of the most famous Vulcan pilots and the only pilots to have flown the Vulcan in a wartime combat role. A must have for any Vulcan enthusiast.